The Treaty on European Union introduced specific objectives for the Development Cooperation Policy of the Community. Articles 130u–y afford the Community an opportunity to eliminate the inconsistencies of the past which have arisen through the gradual and patchwork emergence of the Community's Development Cooperation Policy. The also give the Community a much-needed opportunity to adopt an integrated and coherent policy which will promote the economic and social development of all developing countries and their gradual integration into the world economy, and which will make a significant contribution to the campaign against poverty in developing countries. 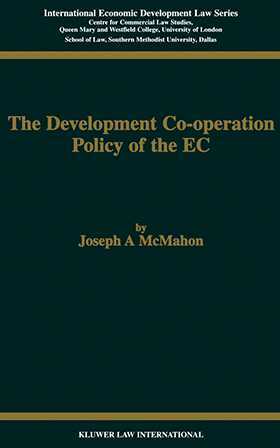 Beginning with an overview of the scope, objectives, and development of the policy up to 1992, this valuable study goes on to analyze the region-specific application of the Community's Development Cooperation Policy by examining the relationships established through the Lomé Conventions with the countries of Africa, the Caribbean and the Pacific, and through other agreements with the countries of the Mediterranean, Latin America and Asia. In each chapter, the focus of attention is the trading relationship established with the Community. Chapter 6 is an examination of two problems of coordination; between the Development of Cooperation Policy and other Community policies; and between the Community Policy and those of the Member States. The conclusion emerging from the discussion is that one very important area of coordination was omitted from the provisions of Articles u–y, namely the coordination of the instruments of development cooperation themselves. The final chapter proposes a new Development Cooperation Policy for the Community to meet new objectives set by Articles 130u–y. A New Development Cooperation Policy?